The diaphragm is innervated exclusively by the phrenic nerve and thus phrenic nerve stimulation (PNS) provides a specific means to investigate the diaphragm independent of other in-spiratory muscles. indices that may not be specific for diaphragm contraction when measured during voluntary maneuvers do relate to the diaphragm when they are derived from PNS. Examples include surface recordings of the electromyo-gram of the costal diaphragm (EMGdi), Pmo or Pes, and phonomyogram (PMGdi). The other major feature of PNS is that it eliminates the influence of the central nervous system. Figure 7. 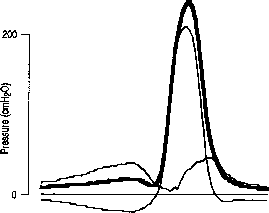 Simultaneous pressure measurements from esophageal (Pes), nasopharyngeal (Pnp), and mouth (Pmo) balloons in a normal subject performing sniffs of increasing strength, to illustrate close correlation of the waveforms. Reprinted by permission from Reference 65. PNS can give important information about the mechanical function of the diaphragm, namely, about how the force of contraction is transformed into pressure, and can be used to confirm whether a contraction is maximal. PNS superimposed on naturally occurring or voluntary contractions (twitch occlusion principle; see subsequent section) can provide an objective estimate of the maximal voluntary pressure that the diaphragm can produce. Since 1980, PNS has been investigated as a technique for elucidating mechanical aspects of diaphragm function. The 1989 National Heart, Lung, and Blood institute (NHLBi) workshop on respiratory muscle fatigue identified it as one of the most promising techniques in this field (80). The stimulus to the nerve, which can be an externally applied electric field or secondary currents surrounding a magnetic field (see Magnetic Stimulation), elicits synchronized activation of motor units and subsequent muscle contraction. The effects of phrenic nerve stimulation can be studied both electrophysiolog-ically (see Stimulation Tests in Section 3 of this Statement) and mechanically (this Section). Four main PNS techniques have been used, mostly in healthy volunteers, less often in patients. Two of them, needle stimulation (81, 82) and implanted wire stimulation (83), are invasive, with the risk of hematoma and phrenic nerve damage. Needle stimulation is not now recommended, and is not further discussed. implanted wire stimulation is probably safer, and may be a convenient means to obtain repeated twitches over long periods of time. The two others techniques, transcu-taneous electrical PNS (ES) and magnetic stimulation (MS), have been more extensively studied and have minimal side effects. For laboratory and clinical studies subjects should be sitting in a comfortable chair. Headrests may be helpful for ES. Lung volume. A major condition for evaluating the pressure response to PNS is adequate relaxation of the respiratory muscles at FRC, or within approximately 500 ml (84). Posture. Most studies have been performed with seated subjects, but twitch transdiaphragmatic pressure (Pdi,tw) seems to be little altered by posture in contrast to sniff transdia-phragmatic pressure (Pdi,sn) and static Pdi (56, 65, 84, 85). This feature could be useful in an intensive care unit (iCU) setting. Figure 8. Pressures during a maximal voluntary cough in a normal subject showing high positive gastric pressures generated in abdomen (Pga; thick line) and esophagus (Pes) with low Pdi during the maneuver. 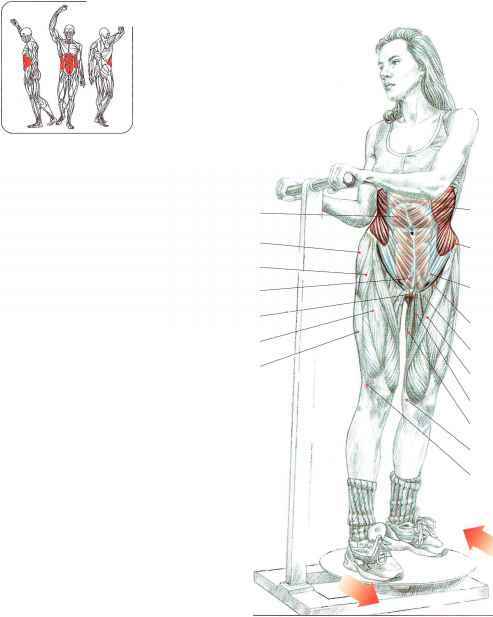 pliant abdominal wall; this may be appropriate for physiological studies (56, 88, 89). In a clinical setting it is difficult to standardize a binding technique and so the abdomen is usually unbound.